Some of you may well know what a LOBO is, if not it is a Lend Option Borrow Option. The are complex financial instruments created by City Pin Stripe boys and sold to Local Authorities. Tory led KCC is the the third-biggest LOBO borrower in the UK. They have 25 LOBO’s see here → KCC LOBO’s The LOBO’s were all taken out between 2004 and 2011 and the total value is £441,800,000.00. Yes four hundred and forty one million eight hundred thousand pounds worth. All these loans are repayable over 40 to 61 years. And if they were all called in today, the sum repayable would be close to £800 million pounds. Does Tory led KCC have that amount in their reserves? So what is a LOBO. ?Let’s say we Shepwayvox (SV) offer to lend you £40 on which SV will charge you an interest rate of 3% over five years. Someone else comes along and offers you the same deal, but with the twist, that he wants the option to demand repayment in full whenever he chooses. You wouldn’t borrow money from him because he is clearly offering a worse deal. Suppose he sticks to his guns but as a concession he will lend you the money at only 2.9% interest. Would you take that? What about 2.5%? 2%? Essentially what SV are asking you to do is to value the option of the lender wanting their money back. Why would the lender want their money back? There may be all kinds of reasons, but the most likely is that interest rates have risen to say 4%; and they would rather lend the money to some other person than have your 3% coming in. Of course, as a borrower, having to suddenly repay the entire loan when interest rates rise is the worst possible thing for you. SV assumes you haven’t got the money to repay it. Unless you have hidden reserves, you’re going to have to repay the original lender and then borrow from someone else at 4%. Ouch. There is nothing unethical or unusual about this. In the LOBO deals, the lender has the right to ask for the loan to be repaid early. So they will charge less interest because they own a valuable option. The question still remains, how does the borrower value that option? “How does Kent value the loans? 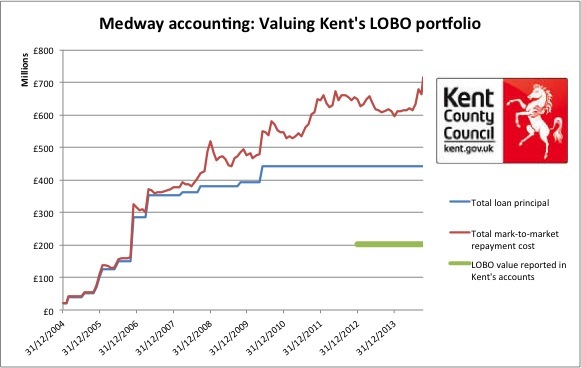 In its latest annual accounts 14/15, Kent says its LOBOs are worth £200.7 million. When pressed, Kent adds that this figure represents just part of the loans with ‘uncertain duration’. That’s conveniently smaller than the £441.8 million face value of the loans. But compare that again to the mark-to-market repayment cost of the loans, which on 31 Dec 2015 went above £770 million, according to our estimates (see chart). Putting it another way, the difference in value between what Kent says the LOBOs are worth and what the banks would legally require today is more than the council’s annual families and social care budget. Now a thing to remember is that the LOBO’s £441 million divided by Tory led KCC council tax income, £940 million, times by a hundred equals 47%. So what does that mean? Well it means that 47% of the money raised locally through council tax is paid straight back to the City of London banks, as repayment for LOBO loans or PFI (of which KCC have both). So 47% of KCC Council Tax precept; which is £988.24 does not get spent on services, such as roads, schools, lighting, potholes etc. What it means is that £464.47 is used to service the LOBO’s and the PFI’s, so you as a resident of Kent are only getting £523.77 worth of Services. Is it any wonder then that Tory led KCC’s services are failing us so drastically and that schools such as Pent Valley need to be closed because the bankers need to be paid. It doesn’t surprise us at Shepwayvox, all Tory led KCC are doing is deferring the debt to a later date, ie passing it on to the grandchildren, so in essence trying to make themselves look like responsible fiscal guardians of the public purse, which when you look at it little bit more closely, simply isn’t true. Thanks for help from Rob Carver & Ian Fraser for their insightfulness and also to Joel Benjamin whose excellent article at Open Democracy contributed to our outstanding. 1 Comment on Going Loco about LOBO’s. Mr Carter…..concluded “Only Conservatives have the experience and track record to prove that they can be trusted to provide high quality services. We cut waste and focus on the services residents need – that’s why Kent’s Council tax is low – and hasn’t been increased for three years. It seems Carter isn’t too hot with his own financial affairs..